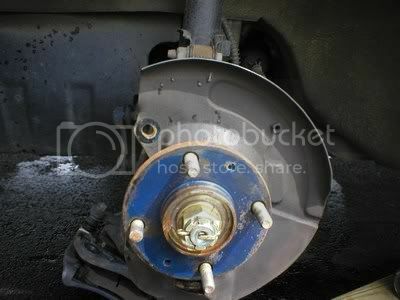 HOW TO FIX 1998 MITSUBISHI GALANT : TRYING TO REPLACE 3 BROKEN WHEEL STUDS ON FRONT WHEEL. HOW DO I REMOVE THE ROUND BRACKET HOLDING STUDS? Having problems with your 1998 Mitsubishi Galant ? Trying to replace 3 broken wheel studs on front wheel. how do I remove the round bracket holding studs? \015\0122. Remove the Caliper from the knuckle. you do not need to remove the\015\012bolts that hold the actual caliper together, just the ones that hold it\015\012to the knuckle. i pointed to the one on top that you need to remove,\015\012just find the other one on the bottom and take that one off too. \015\0123. if the rotor will slide off easily, then take it off. it will just get in the way\015\012if its bobbling around everywhere. if it doesnt come off, dont worry,\015\012you will just have to reach around it a tad bit more. 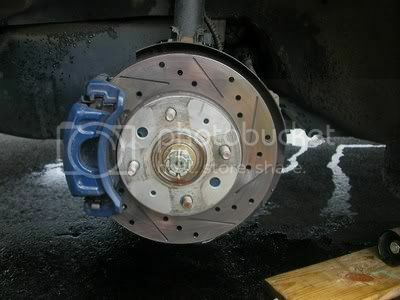 mine slid off\015\012fine, because i put zinc coated rotors on, and because i sprayed some caliper paint on the hub. \015\0124. 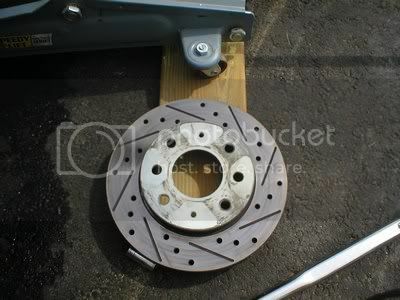 rotate the hub so that the damaged stud is not in front of the cover. \015\0126. stick the new stud through the hole and hold it in place with your\015\012hand. 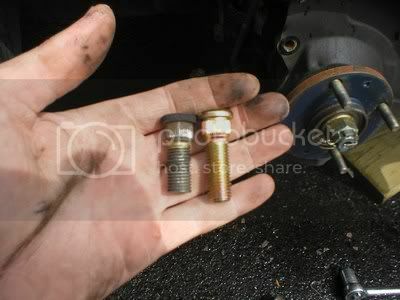 screw on whatever lug you dont care about as much as you can with\015\012your hand. then screw it down enough so you can get the lug on it with\015\012the wheel and rotor on(you will see it start pushing the top of the lug\015\012up). i wrapped the hammer with a rag, and then put it underneath one of\015\012the other studs to keep the thing from spinning(be careful not to\015\012damage the threads though). \015\0127. 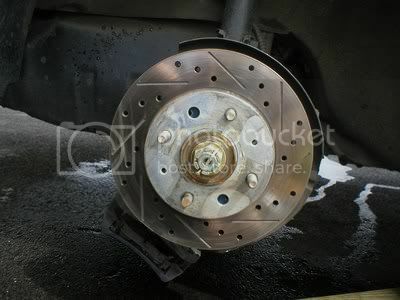 put the rotor back on if you took it off, bolt the caliper back down\015\012to the knuckle after sliding it over the rotor, and put the wheel back\015\012on. tighten down all the lugs as much as you can(so that the wheel\015\012doesnt move, lower the car enough so that the wheel wont spin, and\015\012completely tighten them. after a couple days of driving, make sure the\015\012lug on the stud that you repaired is still on tightly. yeah, i need to\015\012get another lug.